Those of us who know and love retired racers know that their previous careers often leave them with musculoskeletal injuries. Sometimes these injuries are obvious; fractures or extensive soft tissue damage with scarring; and we anticipate some disability as they age. But often previous injury is invisible to the new ‘parents,’ especially in young to middle-aged dogs who have not been strenuously exercised during their rescue or fostering experience. Subtle injuries may include dislocated toes and tails; sprains or strains of ligaments or tendons that were not appropriately rested following initial injury with resulting contracture (shortening) of scar tissue and decreased range of motion; hairline fractures; and spondylosis, an arthritic condition of the spine. 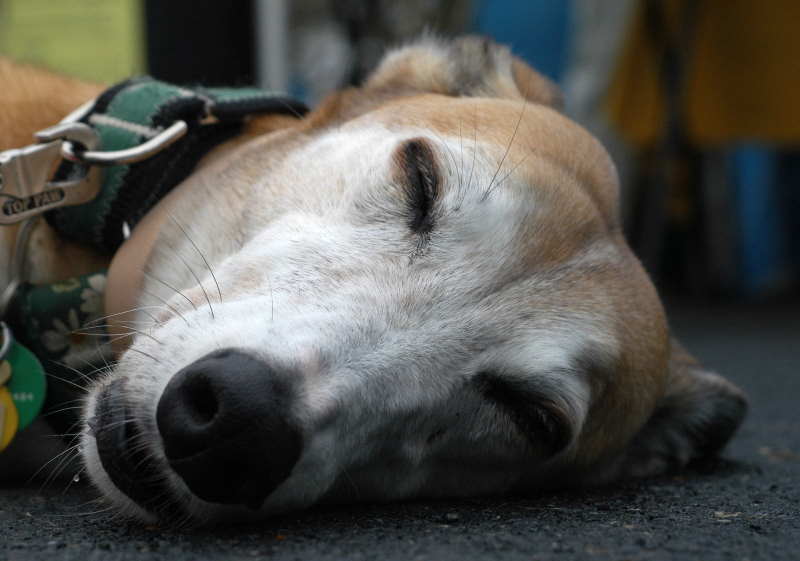 Greyhounds as a breed can also suffer from immune-mediated arthritis when they are young, leaving them with long term degenerative joint disease. Note that few of these dogs survive to be racers or rescue candidates. Any or all of these preexisting conditions may surface months or years after adoption, often when the Grey is given the opportunity to run with other dogs or lure course. Your veterinarian will determine the source of your Grey’s discomfort using palpation and range-of-motion examinations, gait analysis and perhaps some form of imaging. Imaging includes x-rays, computed tomography and magnetic resonance imaging and bone scintigraphy. Most veterinary practices have efficient radiology equipment on site to take x-rays. CT scans and MRI’s (fancy computer-guided, 360° x-rays with high contrast between bone and soft tissue) and bone scintigraphy (imaging of radioactive isotopes that selectively go to areas of high cell activity such as fractures) all require extremely expensive, highly technical equipment and are generally provided by veterinary referral centers such as the Animal Medical Center in New York City or teaching hospitals such as Tufts University School of Veterinary Medicine. Several medications are available to slow the progress of arthritis and relieve pain. It is important to understand that arthritis is like a ball rolling down a hill. Once the process is initiated, we can’t stop it or reverse it. But we can slow it down. Chondroiten sulfates, available at health food stores or from veterinarians as Glycoflex® or Cosequin®, act to nourish cartilage cells lining joints to slow the progress of arthritis. Anti-inflammatory drugs, either steroids (such as prednisone or non-steroidal anti-inflammatory drugs such as aspirin, butazoladin and Rimadyl®) can decrease the activity of inflammatory cells in the joints and relieve pain. High doses of Vitamin C have also been useful in slowing arthritis’ progression. Several herbal therapies have been used in Traditional Chinese Medicine and Euro-American herbalism for arthritis discomfort and disability in humans and animals. These include bay, cayenne pepper rubs, feverfew, yucca and tumeric, to name a few. A more complete recommendation can be made by a practitioner of herbal medicine. Along with herbal and nutritional therapies, pet owners interested in holistic treatments may want to look into acupuncture, chiropractic and magnetic therapies as treatments which can offer pain relief and increased function to some animals suffering with chronic arthritic conditions. The International Veterinary Acupuncture Society and the American Veterinary Chiropractic Association provide training and certification to veterinarians. Occasionally, older dogs are presented with symptoms of sudden onset of ataxia or wobbly, uncoordinated gait, disorientation, loss of balance and a pronounced tilt to the head in one direction. Sometimes these dogs circle to the side of the head tilt. There may be nausea and vomiting and the eyes may exhibit nystagmus (rapid, uncontrolled movement). The organs that control balance make up the vestibular system in the inner ear. Any infection, tumor or injury that affects the inner ear can cause poor balance, head tilt, disorientation and vomiting due to a sense of motion sickness. Examination of the ear canals and x-rays of the skull to examine the inner ear for signs of disease are a first step in diagnosing vestibular syndromes. If no evidence of infection, tumor or injury can be found, idiopathic or senile vestibular syndrome is diagnosed. This is a diagnosis of exclusion; there is no test for senile vestibular syndrome. We just rule everything else out. “Idiopathic” basically means we don’t know why it happens, but approximately 40% of all canine vestibular disease falls into this category. Fortunately, dogs recover from senile vestibular syndrome in three to six weeks. Various medical treatments have been attempted, including steroids and intravenous fluid therapy, but no particular treatment hastens recovery. Good nutrition and nursing care to ensure that the dog doesn’t injure itself staggering around are probably the most important components of recovery. Occasionally there is some residual head tilt, but all dogs recover. If the dog fails to recover, the diagnosis should be reconsidered.